If you are looking for unique furniture that you can use outdoors, then you have come to the right place! 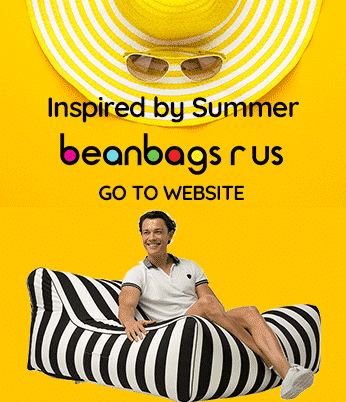 Bean Bags R Us carries a wide range of fun and new furnishings that will brighten your outdoor living space! Whether you want a casual lounge for your deck or a water-friendly pool float, we have what you need, so say goodbye to sagging lawn chairs and uncomfortable wooden furniture and hello to bean bags! When you think about cool outdoor furniture, what comes to mind? Many think of brightly colored and soft seating that can withstand the rain, sun, and whatever else gets thrown at it. Bean bags are often the perfect choice because they are full of lightweight polystyrene pellets, which means they are capable of handling moisture without sagging or mildewing. The soft filling stays soft, so whether it’s the first or hundredth time you’ve sat in the chair, it’s still just as comfortable! Bean Bags are a marked improvement over lawn chairs that begin to sag after only a few uses! Another key reason that many choose bean bags is because of the cost – bean bags are often far less expensive than many of the leading comfortable outdoor furniture. 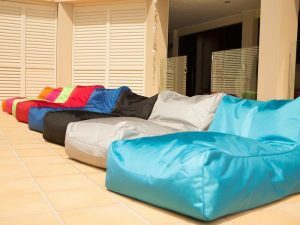 Now that you understand why bean bags are so popular when it comes to cool outdoor furniture, the next thing to figure out is how you will use them. There are many options available, so the possibilities are almost endless! One option is to choose several bean bags in a variety of bright colours; creating a bright pop of colour in the lawn and makes the seating look fresh and inviting to family and guests. Place the chairs around a low table for a fun and unique outdoor lounge area. To make this area feel cozy, you can try adding colour-coordinated drink-ware or plant matching flowers nearby. If you have a pool, you may want to consider purchasing floating bean bags. Then you can take your new furniture from the lawn right into the water without needing to buy extra floats! Another option is to purchase lounge style chairs and arrange them on the patio or in the lawn to create a fun and sunny spot to read a magazine or work on your tan! While our products do not require the kind of upkeep that traditional outdoor furniture does, they do still need a little care and maintenance from time to time. The most important thing is to make sure that if the chairs get wet, they have enough time to thoroughly dry. The best way to do this is to place them against a fence or wall so that they can drain. Even though the chairs use high-quality materials, they may get dirty or stained if you spill something on them. If this happens, you should try spot cleaning them, or if that fails, rinse them with water. If you will not be using the chairs or lounges for a while, it may be a good idea to store them away from the rain and sun so that your cool outdoor furniture will stay clean, dry, and looking like new. For more information here are five easy tips on how to clean your beanbags.